Ms. Schlesinger has been working with a great new tool provided within our School Library Cataloging system (Destiny). Please click on the image above to check out this “collections” feature. It allows us to pull just about any kind of information (books, weblinks, articles, ebooks, pdf’s, etc) into one very easily accessible area. Visit the College Resources Collection for all things college for VIMSIA. Great reference books for researching colleges, access to our own online tools like Naviance and Method Test Prep, tips and articles for SAT and ACT prep and more. Thanks Ms. Schlesinger and Ms. Ebe for their hard work on this. 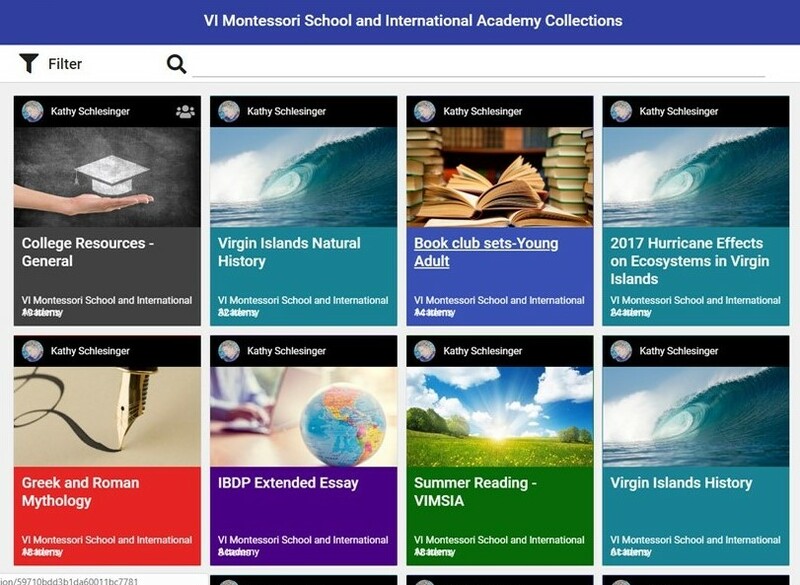 All things Montessori Parent Education - Yep, we’ve pulled together great information to help you research what Montessori is all about. Children’s books for your island child - visit the Virgin Islands Books for Children collection. With her many years of experience here and at Dockside, Ms. Schlesinger has a great grasp on books for our children that reflect their island roots. The VIMSIA Library Catalog got a facelift as well - please visit it! If you want to find VIMSIA Library catalog on your phone, download the app - Destiny Discover.